Portland, Oregon's Uncle Tupelo torch carriers Richmond Fontaine find their own voice and pen sorrowful tales of life and decline in the process. Their forth full-length, Winnemucca, and first for upstart El Cortez Records, finds the band shelving the rock for a while, further exploring their darkest side, as they did for half of 2000's Lost Son. Front man Willy Vlautin's story-telling angle always leaves you with a tear in your eye. He takes you down a road of losers, boozers, and the troubled, as you both examine their lives and try to find some meaning in their existence, before the character gives up on you and falls back into the bottle. 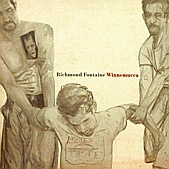 Album opener "Winner's Casino" is as upbeat as Richmond Fontaine gets in the lyrical department. You follow a man to Winnemucca and Winner's Casino, where he wants to be left alone, as it is the only place he can clear his head and feel like he is on the rise. As Vlautin puts it, "It seems like the only place I know where nothing's in decline/ 'Cause there's nothing to do but rise". As lost as that may seem for some, to the character in Vlautin's short story-song, it is the only thing that makes sense. Vlautin may be the ringleader and the engine that drives Richmond Fontaine, but he is not the only component. Richmond Fontaine is a true collective, with Vlautin's lyrics and voice in need of bassist Dave Harding, drummer Sean Oldham, and pedal steel/mandolin/dobro/electric guitar player Paul Brainard to make you feel the songs in your heart and gut. "Glisan Street" will have you in tears with the instrumentation alone, Vlautin's acoustic guitar weeping itself, and the rhythm section of Harding and Oldham adding an eerie trickle, while Brainard's pedal steel puts the finishing touch on you. Then Vlautin's voice and story comes along and you're all but gone, struggling with the bottle yourself to cope with the pain of someone else's life, possibly a character Vlautin made up. It doesn't matter though, they're as real as you and I when you're listening to the song. Ten solid tracks, two of them instrumentals, Richmond Fontaine delivers the best album of their career, a soft, dizzying collection of more sad tales of people trying to make a life of the mess they live. Unlike previous albums, Winnemucca offers up optimism and hope, telling you that death and destruction have passed, and it is time to move on and try to start living again. I'll give this an A.